There must be a very select group of individuals who this movie appeals to. Mainly, female Jewish 20-something comedians who live in New York City and enjoy talking about farts. Well my last name might be Coen, but that’s about the only category that even comes close, and one out of six ain’t great. With fairly good ratings across the board, it would seem that the majority doesn’t agree with me, that they appreciated this film on some level that I most definitely did not. 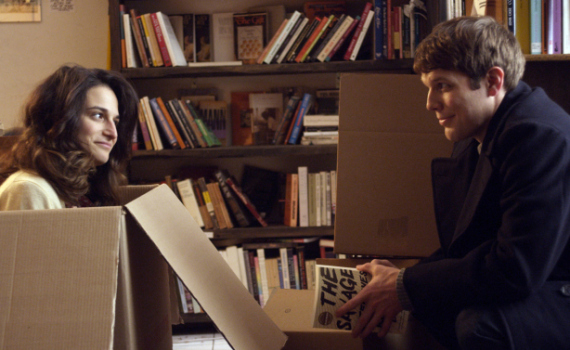 Maybe there are more people out there who enjoy a good abortion joke than I would have thought, because Obvious Child is well-liked by most, but I could not jump on board. Something just didn’t sit right, or feel right, or something, some undefinable mood turned me off, I don’t know, but the indescribable internal muddle I now have was brought on by the film itself and for that I give it all the blame. Living in New York City and striving to become a comic isn’t easy. Just ask Donna Stern, who works at a bookstore by day and does standup at night. The bar scene, the dating scene, parents, friends; life is tough for a young girl in a big city. And life gets a lot tougher when her boyfriend dumps her, the bookstore closes, and her comedy doesn’t pay the bills. Oh yeah, and the guy she just had a one-night stand with accidentally got her pregnant. So now Donna is a knocked-up comedienne who does gigs for free and can’t work up the courage to tell her baby daddy that he’s about to be a father. Maybe she should get an abortion, maybe she should quit standup, and just maybe she should be honest with Max, a guy who meant no harm and could possibly be the nicest guy she’s ever not technically dated. Oh boy. Well, like I said, the humor in this movie missed me. I’m not surprised by that, but I am surprised by just how many people it apparently hit. What group laughed out loud during this film? Young neo-hippie woman with uni-brows, incense, and too many cats? Actually, now I’m just describing Gaby Hoffman, who grew up to be anything but the future we imagined when we watched her as a child. I joke, but I seriously don’t get the appeal of this story or of this main character. I found Donna to be annoying, shrill, pathetic, and a Frances Ha wannabe. This was Robespierre’s first attempt at basically anything, writing, directing, and producing this movie based on her short film of the same name. Perhaps the short is more bearable, a small window into the unusual life of a messed up girl. But somehow I doubt it, and I doubt that I’d enjoy 20 minutes of Donna Sterne when I knew after the first 15 of Jenny Slate that this wasn’t the movie for me.